John was born in a priestly family (Luke 1), but he didn't become a priest as expected. All four Gospels say that John came as a prophet to prepare the way before Jesus. John was a pious man, and he was bidding the Jews...to come together for baptism... And when everybody turned to John--for they were profoundly stirred by what he said--Herod feared that John's so extensive influence over the people might lead to an uprising (for the people seemed likely to do everything he might counsel). He thought it much better, under the circumstances, to get John out of the way in advance, before any insurrection might develop, than for himself to get into trouble and be sorry not to have acted, once an insurrection had begun. So because of Herod's suspicion, John was sent as a prisoner to Macherus, the fortress already mentioned, and there put to death. But the Jews believed that the destruction which overtook the army came as a punishment for Herod, God wishing to do him harm. Josephus implies that Herod executed John for political reasons. Herod was afraid John might have too much influence on the people and thus spark off a rebellion against Herod. In Mark 6 we read that John was executed because he protested against Herod's intention to divorce his wife and marry his brother's wife. Josephus does not necessarily contradict Mark's account. John as a prophet rebuked Herod for his marital entanglements. Since people held John in high esteem as a prophet of God, Herod saw himself in deep trouble. The easiest way out would be to get rid of John, Herod thought. What did John look like? According to Mark 1:7, he wore camel's hair and a leather girdle, and ate locusts and wild honey. He was a man of the wilderness, much like Elijah (1 Kings 17). Since Elijah was taken up to heaven in a whirlwind (2 Kings 2:1-11), the Jews believed that some day he would come back. Malachi, the last canonical book of the Old Testament, promises that God will send Elijah to warn people before the day of judgment. People who saw and heard John were reminded that he may very well be the promised Elijah. In fact, Jesus himself thought so (Matthew 11:13-14). John was not the only one acting in eccentric ways. A Jewish sect in John's time known as the Essenes lived in a separate commune near the Dead Sea in preparation for the final judgment and bathed themselves everyday as a religious ceremony of purification. 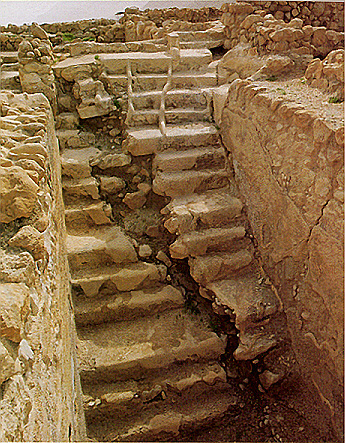 Ritual bathing and baptism may be traced back to ceremonial washings prescribed by the law of Moses, as in Leviticus 15 (see photo of a mikveh, a ritual bath). Josephus says that he himself in his earlier years became a disciple of someone by the name Bannus. According to Josephus, Bannus "dwelt in the wilderness, wearing only such clothing as trees provided, feeding on such things as grew of themselves, and using frequent ablutions of cold water, by day and night, for purity's sake." Bannus was probably a follower of John the Baptist. We read in Acts 19:1-5 that when Paul went to Ephesus, he found a group of people who had been baptized into John's baptism. Apparently there were groups of people who remained loyal to John without necessarily becoming followers of Jesus. Some people asked Jesus how it was that John's disciples and the disciples of the Pharisees fasted whereas his disciples did not (Mark 2:18). People perceived a distinct difference between Jesus and John. Some thought John was demon-possessed because of his frequent fasting (Luke 7:33-34). According to John 3:22-26 John and Jesus were baptizing side by side. If John was the forerunner of Jesus, why was John still baptizing when Jesus himself had already begun his ministry? Although early Christians saw John as a forerunner of Jesus, the disciples of John and others did not see it quite that way. No doubt some of John's disciples did follow Jesus. But many others continued in their allegiance to John without ever becoming followers of Jesus. Today in southern Iraq and in Iran there is a small sect of 20 to 30 thousand members known as the Mandaeans (Man-DEE-uns) who claim to be followers of John the Baptist. They seem to have been an offshoot of second century Christianity. They were apparently influenced by Persian ideas and departed from orthodox Christianity. Their allegiance is more to John the Baptist than to Jesus.